Paris is synonymous with romance. The architectural beauty of the city, the park benches, the gardens and museums all inspire the mood for love. As I walked through the Jardin du Luxembourg one Sunday afternoon I passed lovers on a park bench passionately necking. How cute, I thought, a young couple in love—but as I approached I saw that these were not amorous youngsters but a gray-haired couple. Of course, a fabulous meal with wine is romantic—and easy to come by in Paris. Sitting at a café along the Seine listening to an accordion player is romantic. A picnic in Les Tuileries is romantic. But to me the most romantic thing to do in Paris is to walk somewhere, anywhere, holding NoLo’s hand. 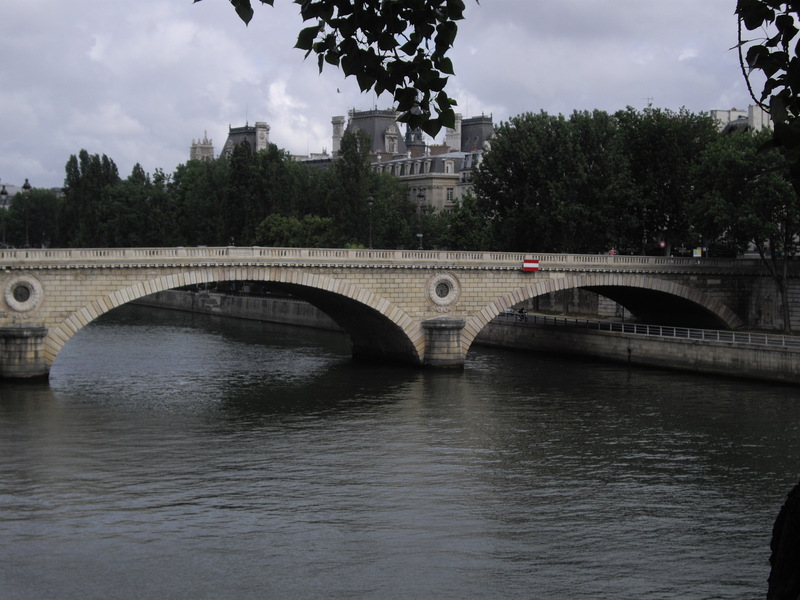 We were standing on Pont Marie, called the Lovers’ Bridge–legend has it that if you kiss under the Pont Marie and wish for eternal love, your wish will come true. As we stand watching the boats float by, two lovers walked up and swoon in an embrace. 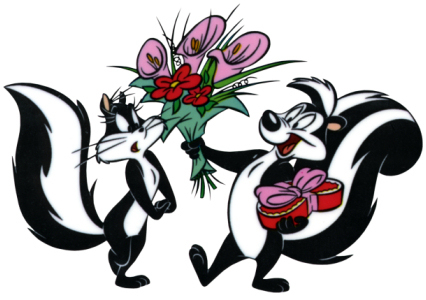 Not to be outdone, in a scene reminiscent of the corny romantic endeavors of Pepe Le Pew, NoLo swept me backwards into an embrace. We almost fell down. Then we laughed until we couldn’t catch our breath. I’ve frozen the cake as the chef on the video instructed. Now he tells us to take the cake from the freezer and “roll” off the brown crust. Ha! There is nothing rolling off the cake. The crust is stuck so I’m going to cut and frost the cakes, crust and all. 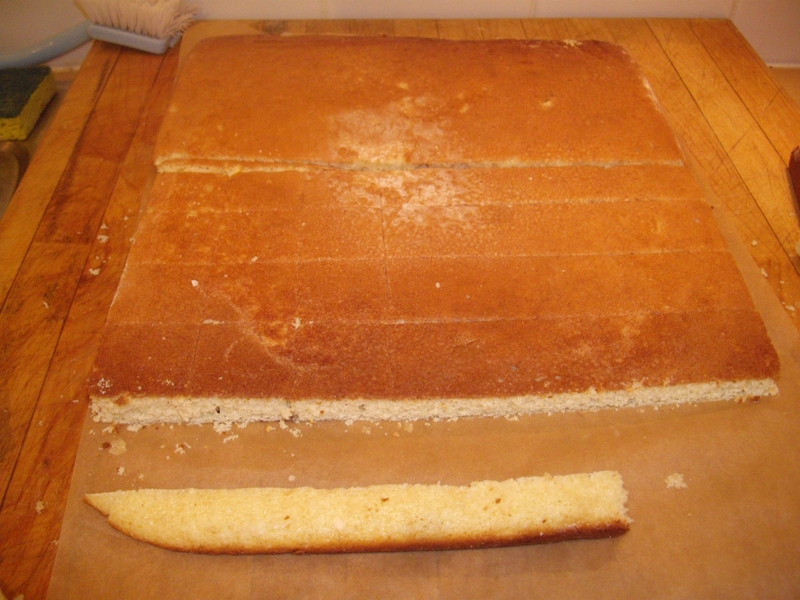 First I cut the edges off the cake using a level as a guide. For some reason my family doesn’t own a yardstick, just a measuring tape with a cow’s head on it, so I use a level. 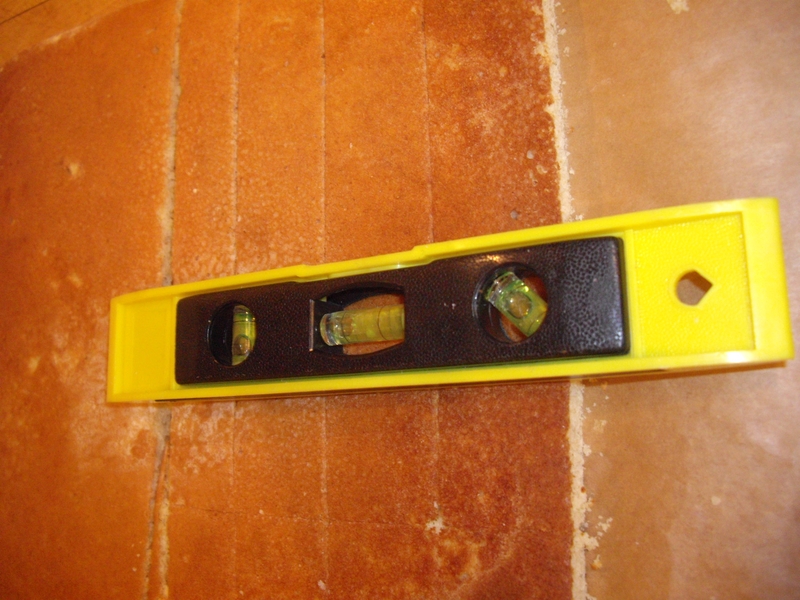 After I cut the edges off, I cut the cakes, always cutting in front of the level. I place the square on a wire rack for frosting per the video instructions suspended over a baking pan to catch drips. 1. 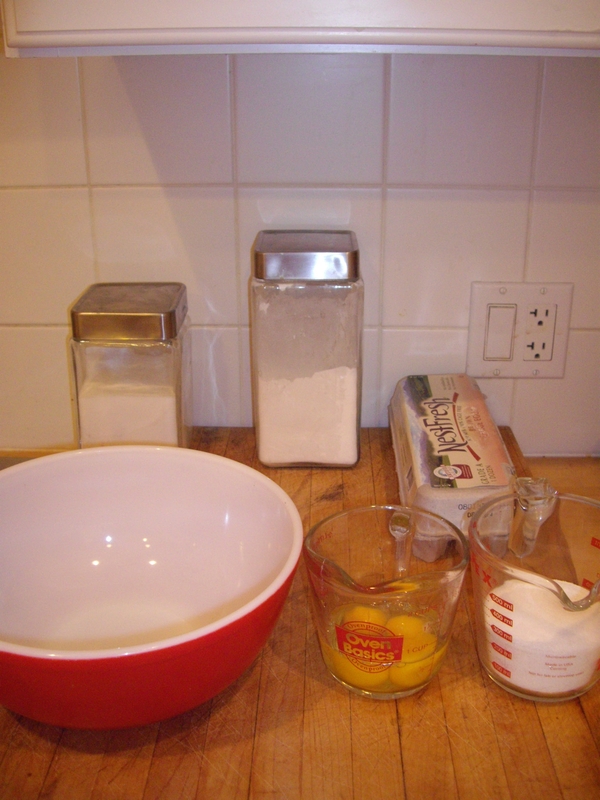 Add all ingredients except for the confectioner’s sugar in a saucepan and bring to a boil. 2. 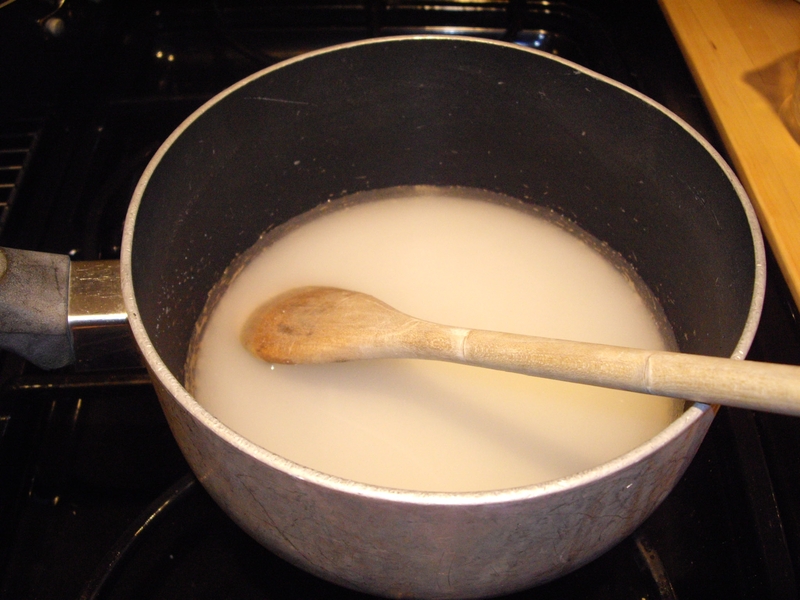 Boil without stirring until the mixture reaches 226 degrees and is the consistency of a thin syrup. 3. Remove from heat and cool to 100 degrees (slightly warmer than lukewarm). 4. 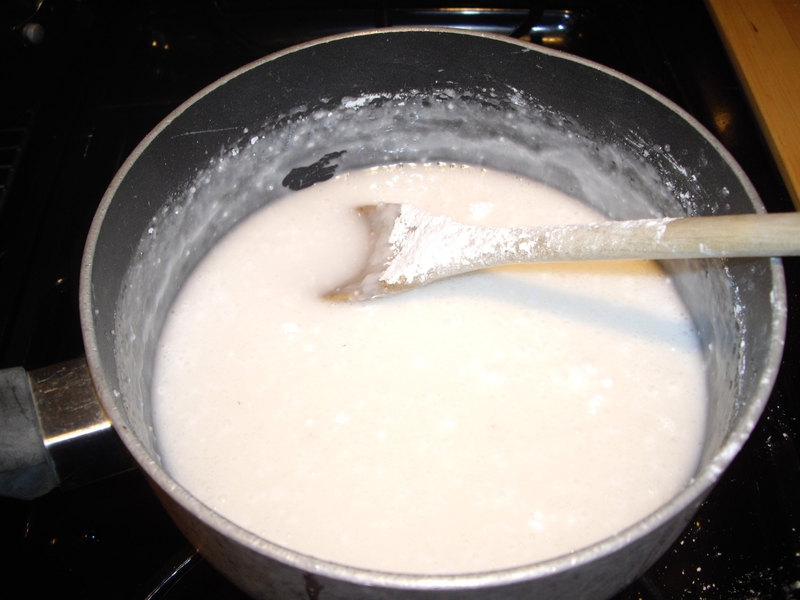 Sift confectioner’s sugar over the syrup a little at a time, stirring to thoroughly combine after each addition. 5. 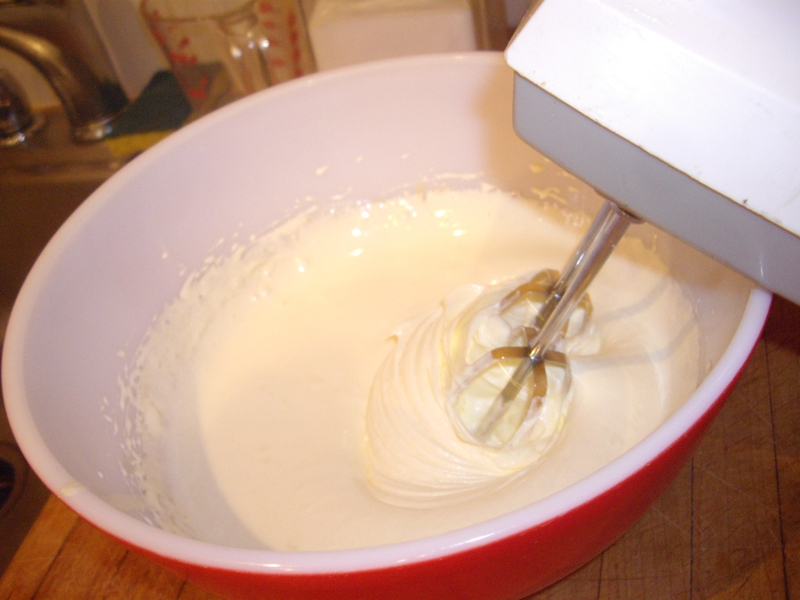 The icing will have reached the proper consistency when it is just thick enough to coat a spoon. 7. Use while warm; if it gets too thick, reheat in a double boiler until thin enough to pour. The recipe says to cool the syrup to 100 degrees before adding sugar. I cooled it until it was barely warm and even then I had to add twice the amount of confectioners sugar before it turned white and the right consistency. Surprise! 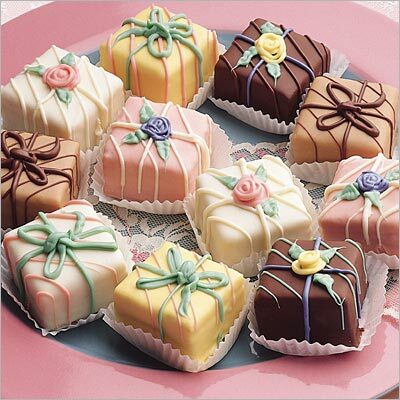 The hardest part of all is to ice the petit fours with the fondant (frosting.) 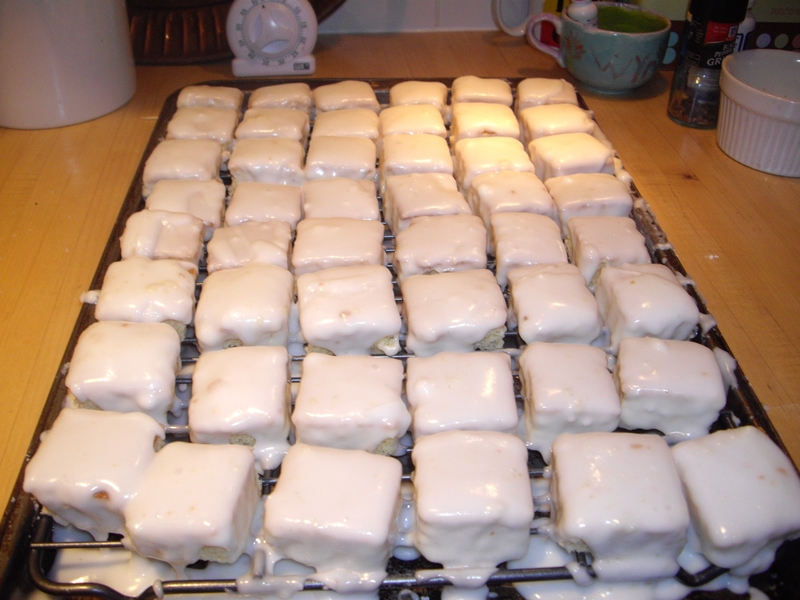 You spoon the icing over the cakes completely coating them and letting the extra frosting drip down to a tray below. It’s harder than it sounds. 1. Pour the frosting over the cakes, moving slowly over each row, allowing the frosting to drip down the sides of the cakes. 2. You can scrape up the icing that accumulates in the pan, reheating it in a double boiler so that you can reuse it. 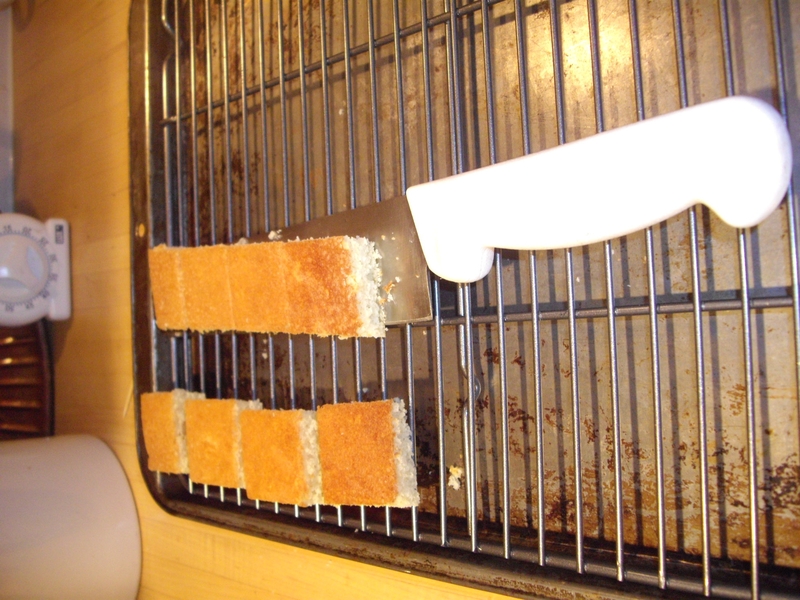 Allow frosted cakes to sit until they are dry, then remove the cakes from the rack, trimming any excess frosting away from the bottoms with a sharp knife. 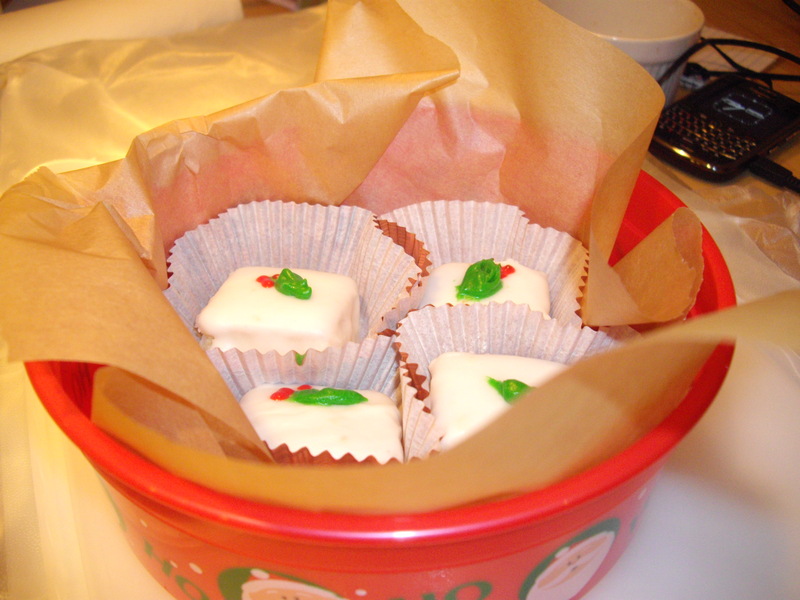 After the frosting dries, you can add a little holiday decoration—I added an impressionist sprig of holly. Full Disclosure: I have never made petit fours before. Actually, I have never made a cake from scratch before. But I’m up for the challenge and excited to bake these elegant little cakes. The recipe says you can used pound cake purchased from the store but that seems like cheating . Afterall, how hard can it be? I found a recipe online. 2. Butter and flour a jelly roll pan. 3. Beat the eggs, yolks, and sugar until light and fluffy. This should take about 10 minutes with an electric mixer. 4. Sift the flour and baking powder over the egg mixture. 6. Fold the flour and milk into the egg mixture gently. 7. Add the melted butter and combine until well blended. 8. 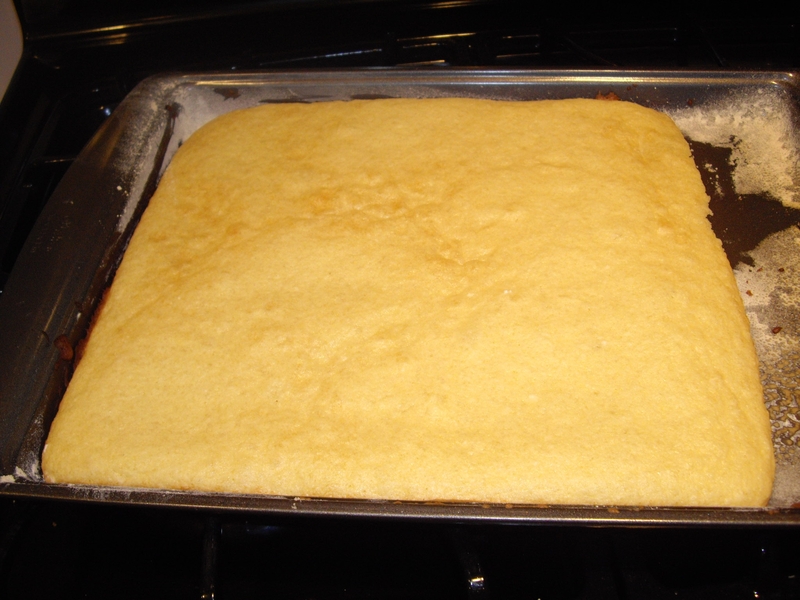 Spread the batter in the pan, and bake for 12-15 minutes until a toothpick inserted in the center comes out clean. 9. Turn the cake out onto a cutting board, and cool completely. 10. 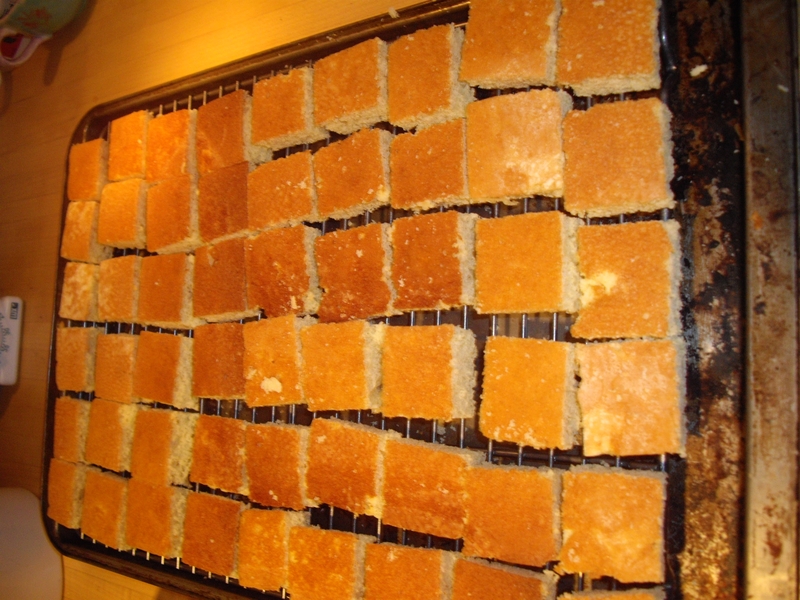 Cut the cake into squares, rectangles or triangles. OK first I assemble my ingredients. 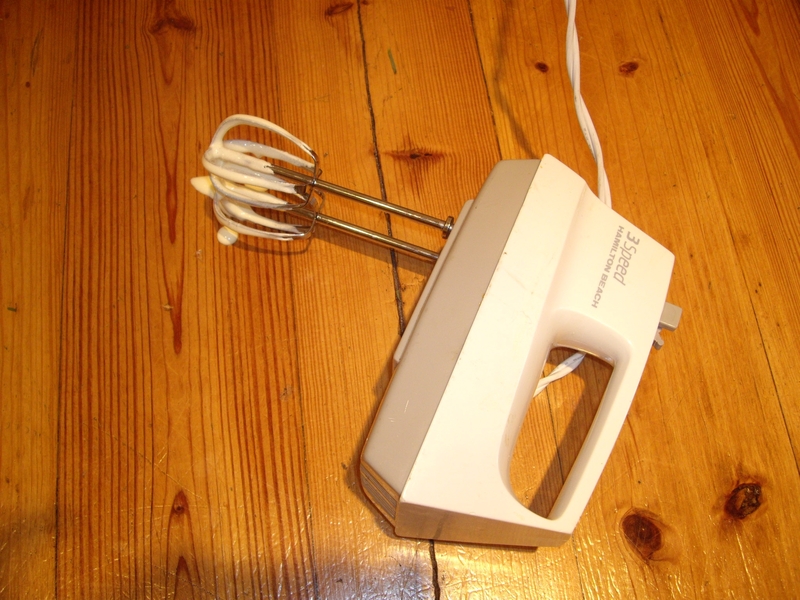 I start beating the eggs, yolks and sugar for ten minutes but the phone rings, it’s my friend Anne and when I pick up the phone I have an accident and drop the blender on the floor. I wash it off and now have lost track of time. Blender on the floor, quelle disaster! So I start over timing the blender ten minutes until the batter is “light and fluffy.” I’m not sure what light and fluffy looks like but when it sort of looks like meringue I stop beating. I add the flour but don’t have a sifter so I just dump it in. Someone in my family has taken my measuring spoons so I use a plain old teaspoon to measure the baking powder. Then I add the milk and butter but the batter looks like the texture of fudge. I watch a YouTube video by a professional baker for assistance. The professional baker says this recipe makes a very dense cake batter—mine is the texture of fudge. So I must be o.k. I try to spread the batter onto the pre-floured jelly roll tray but there isn’t enough batter. I’ll be cutting off the edges so I guess this doesn’t really matter, I just spread it as far as it will go and cross my fingers. While the cake bakes I watch the YouTube video. Comments posted about the video complain that the chef touches the fondant (what I call frosting) but these are germaphobes. So what if I dropped the blender, I washed it thoroughly. I’m sure the chef washes his hands. As I prepare to return home, I am packing my clothes which seem to have expanded, no longer fitting into my suitcase. Part of the problem is the Soldes, the sale in Paris that begins on June 26 and continues through August. Stores slash prices from 30-50 percent so it’s a great time for shopping. I bought a few souvenirs that amazingly are not fitting into my bag so I will need to buy a box at the post office for 40 E to ship back to the U.S.
Farewell, Paris. Until next year! It’s nearly my last day in Paris so I am carefully choosing how to spend it. I stop by the neighborhood pattisserie to purchase provisions–une sandwiche avec jambon and Roquefort, pain aux raisins, and un botteille de l’eau. 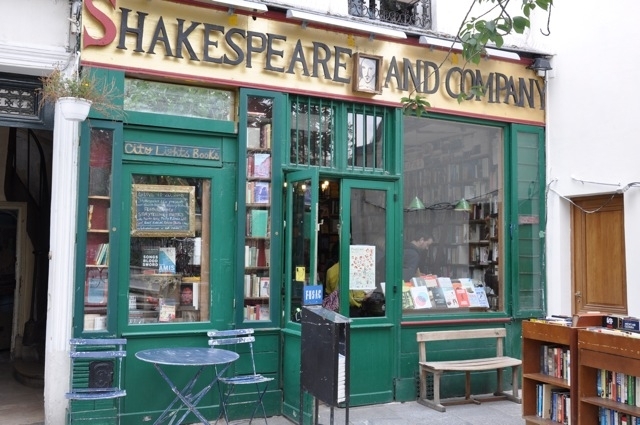 Then a quick stop at Shakespeare and Company to pick up a copy of Julia Child’s My Life in France. Next a walk to the Jardin du Luxembourg down Boulevard St. Michael. 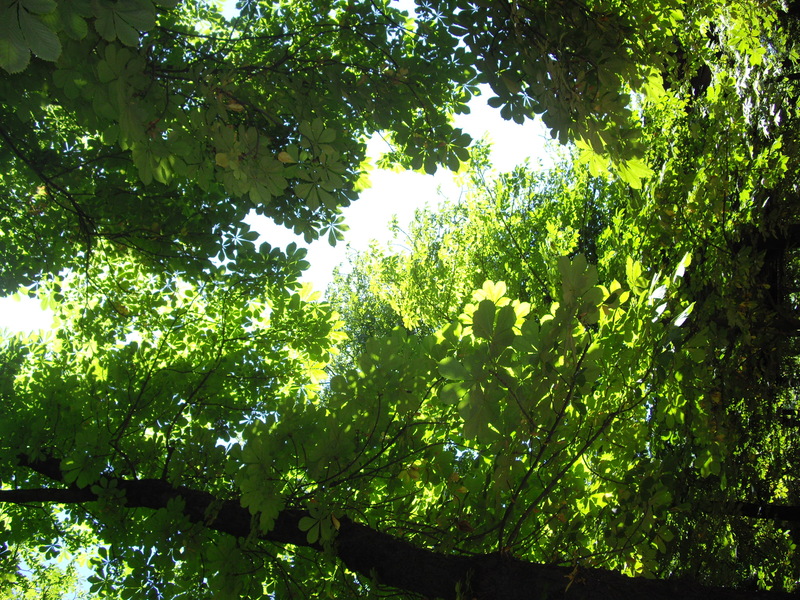 At the garden I find a shady bench to have my picnic and read my new book. My peaceful state is interrupted about an hour later when a mother with two children decide to join my on my bench, of the hundreds of EMPTY benches in the park. Soon the baby cries, the toddler whines and off I go to watch children at the fountain. The Luxembourg Garden is a magical place for children. 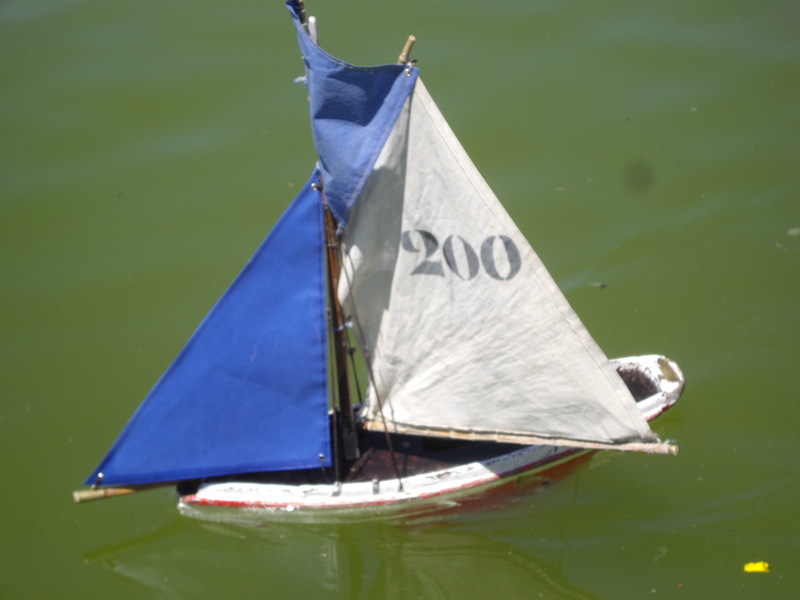 Here a vendor rents little wooden boats to float in the fountain. The children retrieve them with a long wooden stick—no high tech controls here. After the fountain I stop by to watch children ride the ponies. 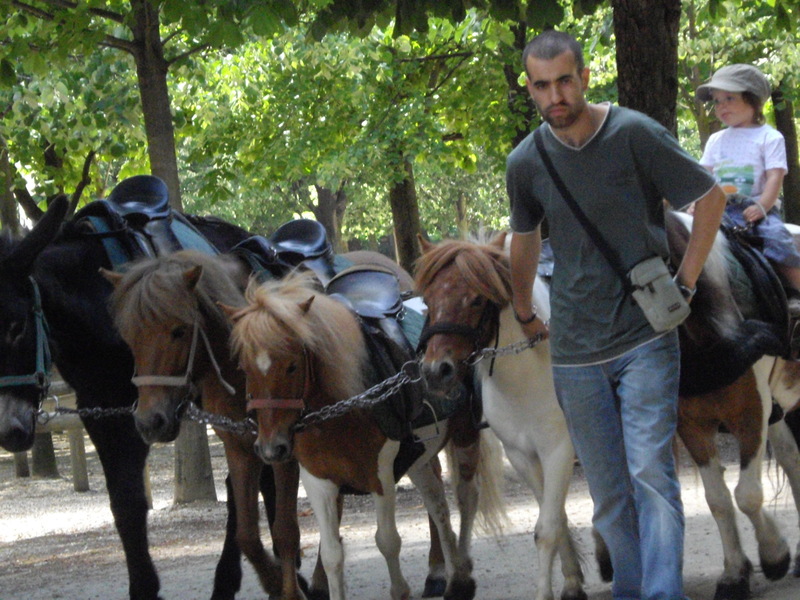 The horses remind me of home in Wyoming. On the walk back to the apartment I stop at Larduree, the famous macaron shop that has a store on the Left Bank, I proceed down Boulevard St. Germain and listen to a fantastic Dixieland Jazz band playing on a street corner. I was so enthusiastic when I put money in their hat that I nearly fell into the band. Next I come to the intersection of Boul St. Germain and Boul Mich as it’s called and traffic is at a standstill. 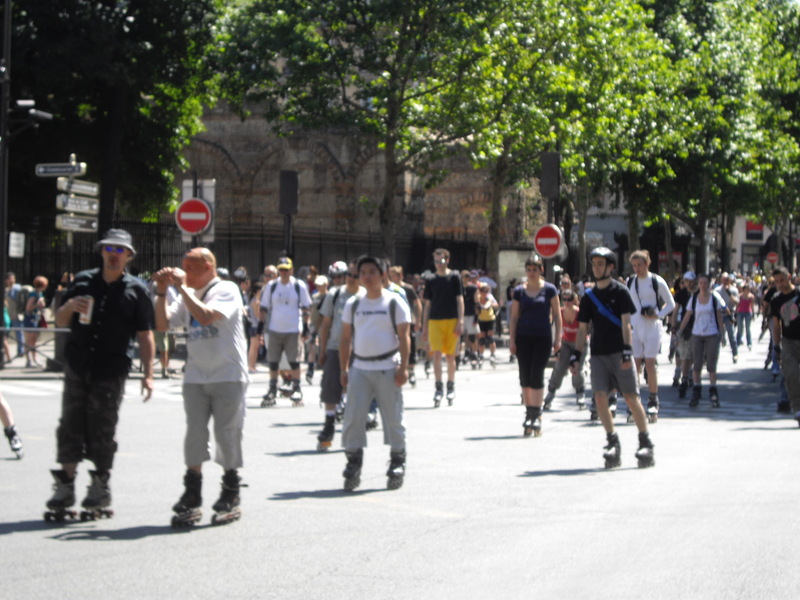 It’s the rollerbladers of Paris once again, skating through Paris. NoLo E-hub and I love to rollerblade but this crowd skates FAST. Oh my God, they fly through the streets—I’ll stick to the sidewalk thank you very much. When I return to the apartment, I’m happy that I’ve had such a full day. Last night I attended the Wine Tasting Tour of France at O’ Chateau along with about 50 other Americans from Chicago, Colorado, California along with Canadians and Australians. Our sommelier Olivier Magny toured us around the Champagne, Loire, Burgundy, South West, Bordeaux and Rhone areas in France all from the comfort of a wine cellar near the Louvre. We learned about the concept of “terroir”—or how the soil contributes to the final grape and how that is one way that America is deficient in grape growing. In France, grape vines may grow down into the ground 30 meters to obtain nutrients and creating a complex flavor in a grape. In the US, many vineyards use drip irrigation which causes the vine roots to grown horizontally along the surface instead of vertically into the earth so the flavors are not as complex. “Um, I think it would be better to say buttery, not cheese,” our French sommelier said gravely. 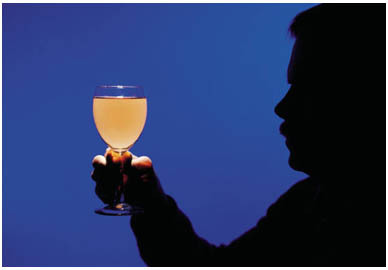 France has 150,000 wineries that produce about 15,000 bottles per year; Gallo however makes 4 million bottles PER DAY. There are so many wineries in France that it has hard to find the same bottle twice—you could buy a bottle you like in one shop but when you tried to buy the same bottle across town it would be impossible. Rosé is the popular choice of wines from May-September in France. The best rosés are from the Côtes de Provence. Olivier is writing a book about Terroir and he has a blog called Stuff Parisians Like. His book called “Stuff Parisians Like” will be published in November – as Olivier points out, an excellent Christmas present. Olivier also points out that we should support the people who produce wines independently. They are true artists who produce wine because of the tradition and the desire to produce the best wine in the world. I left the wine tasting wondering why anyone would ever buy anything other than French wine! The Musée D’Orsay–housed in a former railway station–is known for its magnificent art collection, but I like to visit the museum’s restaurant. Originally the dining room for the Hôtel d’Orsay, the new construction by the architect Jean-Michel Wilmotte sets off the dazzling chandeliers and the painted and gilded ceilings of this dining room, listed as a Historic Monument. 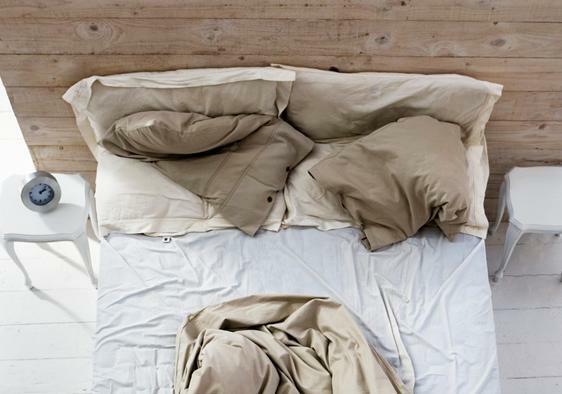 The room–all gold, white, and light–is breathaking. And then there is the food; I had lunch with a group of friends, and we voted it the best lunch on our trip. My sea bass was grilled to perfection and served in its skin. Sitting next to me was poet and chef Travis Cebula, who showed me how to catch the skin under my fork and roll it back like a sardine can—voila—leaving a morsel of the most delicious sea bass I’ve ever eaten. One person in our group didn’t utter a word the entire lunch, so absorbed was she in her salade. The chef Yann Landureau offers traditional French cuisine, interspersed with original dishes that are linked to the museum’s current events. And the service was the professional service that we’ve found throughout Paris–with the exception of only one rude maître d’ experience. “Pas de grave,” as they say in Paris–not a big deal–we headed across the street from the Louvre, and enjoyed a fabulous meal at the Café Ruc. I had shrimp risotto with creamy risotto and grilled shrimp served with a tiny taste of lemon. Magnifique! 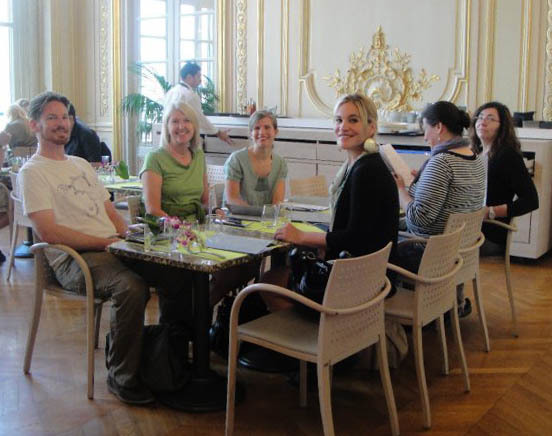 Another favorite restaurant experience is the garden café at the Musée Rodin. This little café serves fresh delicious salads and entrees in a shady garden. It’s always crowded and you must guard you food from the brazen birds that raid tables. A line can be found at the glacé stand, where I had one of the best caramel glacés served in a cone. Caramel is my new favorite flavor. Ile Saint Louis was resurrected from swampland and it is surrounded by the Seine. So why am I surprised by the voracious, plump mosquitoes? Of course these are mosquitoes with style; like other Parisians they stay out late, coming inside only during the wee hours of the morning when I am sound asleep. They probably wear tiny little berets. Since the historic buildings like the one I am staying in don’t have air conditioning, on hot nights we are forced to sleep with the window open — creating a 24-hour buffet for hungry bugs. I wake up with bites on my nose, cheek, arms — anything that is exposed to this army. However, if I were a mosquito I would head for the island, too. 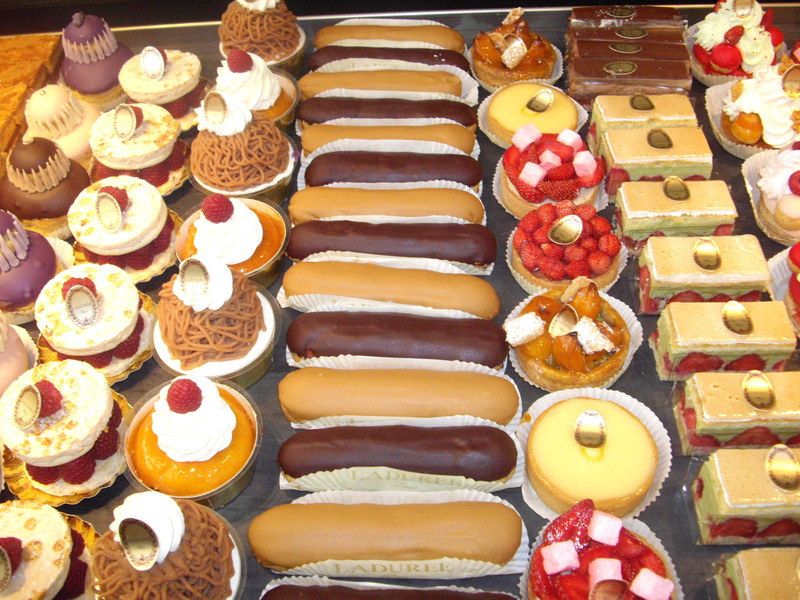 There is an ice cream stand and several patisseries on every block, not to mention the chocolatiers. 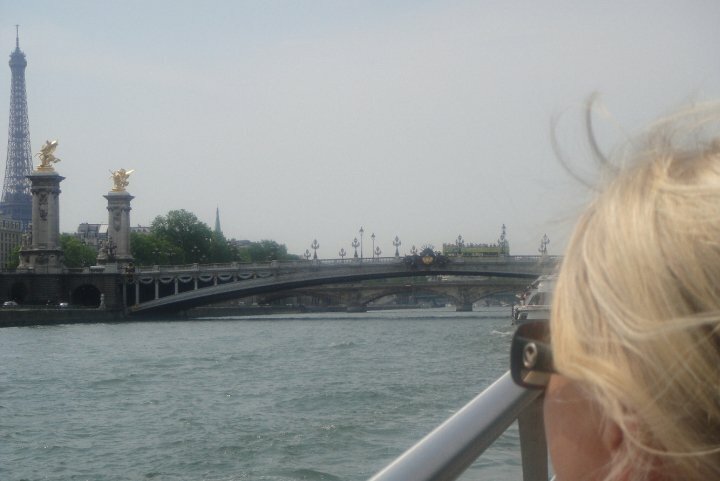 I would fly straight to the Ile Saint Louis and feast on sugar-laden visitors like me. 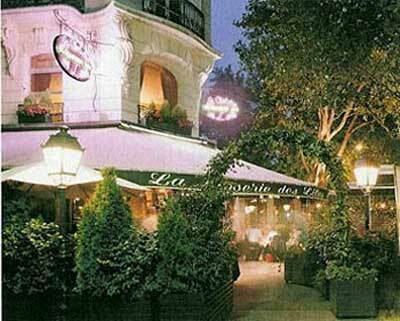 Located on the south side of the Jardin Luxembourg on the Boulevard du Montparnasse, Closerie des Lilas is unlike the other two favorite Hemingway cafes we visited – Aux Deux Magots and Café Le Flore on Boulevard Saint Germain. At those restaurants it felt like there were many more tourists than French people, and the food was o.k.—café food—but nothing to rave about. The atmosphere at both cafes was one of constant turnover—the French are wonderful about not rushing you—but tourists tend to eat their lunch and then move on to the next thing instead of lingering for hours over wine or a café crème. Lila’s is different. I walk there with Sarah, my young friend and daughter of my friend Sandy. (Sarah arrived on Wednesday and NoLo E-hub left Friday morning to return to work in the states.) We’re seated at the last table in an ivy-covered terrace, and Sarah remarks that it reminds her of the The Ivy in L.A.—the restaurant where Hollywood power brokers lunch. We’re both famished from the 45-minute walk to get here from our apartment, so we anxiously scan the menu. On French menus there are many “cooking” terms that you probably didn’t learn in French Class so it’s dangerous to see “veau” and say to yourself, “I love veal!” and order it because you may have just ordered “tete a veau,” veal head, and unless you’re fond of it, I wouldn’t advise it. When I see “riz veau” on the menu, I think, veal with rice, but when I ask the waiter what it is he tells me sweetbreads, something I’m not fond of. I order artichoke hearts with tomatoe puree, and steak frites. Sarah orders melon with prosciutto and asparagas soup. We both have “pink wine,” and chat while we await our meal. Around us, only French is being spoken—we don’t see another American. The restaurant opened in 1847 and through the years has been a favorite of literary greats like Baudelaire, Hemingway, Picasso, Sarte and Fitzgerald. 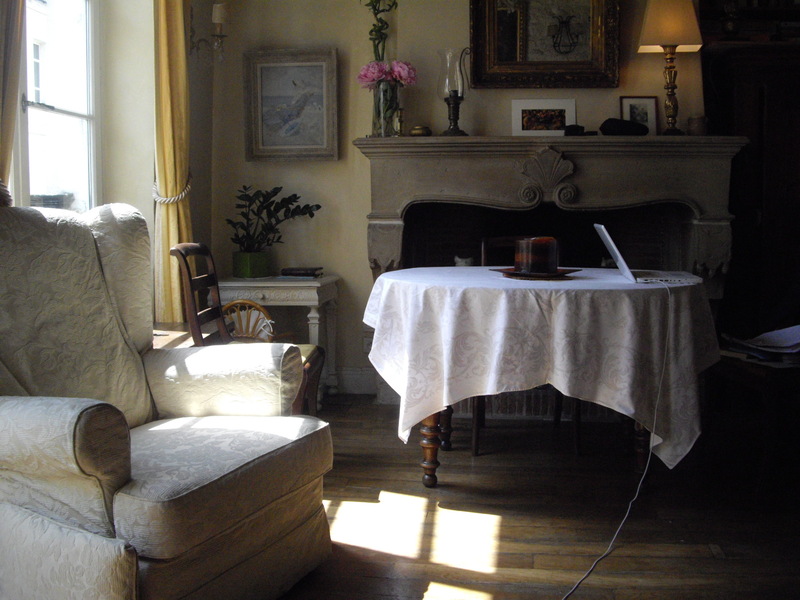 Hemingway wrote The Sun Also Rises at one of the tables here, and he said his famous comment to A.E. Hotchner while sitting at Lilas. It was true; we had never lingered over lunch before and it was the perfect day for it, overcast with the sun peaking through clouds periodically, the feeling of an afternoon that there is no reason to hurry. We walk back to the apartment through Luxembourg Gardens.